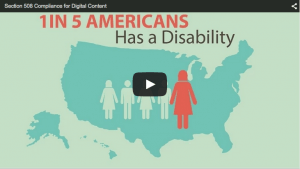 With 20 percent of adults reporting some form of disability, making your digital learning content accessible is good business sense. In many cases, it’s also required by law. Section 508 of the Americans with Disabilities Act (ADA) requires that accessibility standards be met for electronic and digital content produced by organizations that receive funding or revenues from the federal government. In practice, meeting these requirements requires a knowledge of the standards and technologies available to make your content accessible. When it comes to eLearning, Monarch Media has developed a toolkit of best practices and software applications to help ensure your courses and resources meet Section 508 requirements, as well as make your content as accessible as possible for learners with a range of disabilities. What will you learn from the video? Feel free to click the sections of the video that interest you most! Section 508 requires all Federal Electronic and Information Technology (EIT) developed, maintained, procured, and used to be accessible to federal employees and members of the public with disabilities. Monarch Media has experience creating Section 508-compliant digital learning content for organizations ranging from the U.S. Department of Education to Pepnet2, a nonprofit focused on deaf and hard of hearing students. We have worked with Pepnet2 to ensure their online materials meet the needs of all disability types while still maintaining interactivity and multimedia elements to make the courses fun and engaging.